We are situated 20 miles from Poole and 30 miles from Bournemouth in the beautiful seaside town of Swanage. Today our Church has around 70 members with youth groups playing an important part in its life and our Toddler Group. Scouts, Guides, Cubs, Brownies, Rainbows, Beavers and Junior Church meet as part of the Church family. Swanage is a small seaside town with many attractions, including a safe sandy beach. Our halls are ideally suited for camping holidays for youth groups. 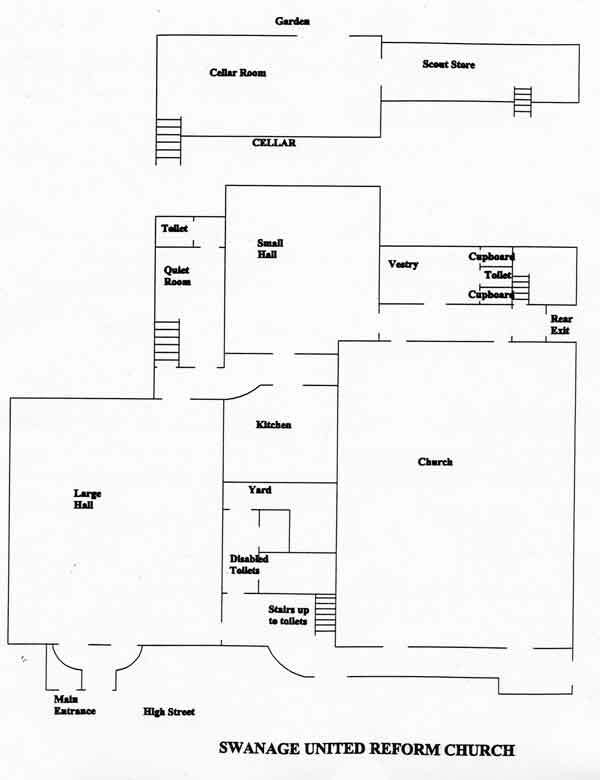 The plan shows the layout of the halls. Our kitchen is well equipped and complies with the latest hygiene regulations. A small lounge and a vestry can also be used as accommodation for leaders. Bookings can be taken for most times of the year, but the main summer holiday times book up early. You can now view the Church premises from the comfort of your comuter, just click on 360 views for a tour of the Church, kitchen, main hall, small hall, lounge as well as a view from the street. For further information contact Charlie or Jeanne Harrison, 01929 424404 or write to 123 Kings Road, Swanage, Dorset, BH19 1HN. The size of this is approximately 11.2 x 9.55 metres with a small stage at one end. There is a door to the hall directly from the road, with a small entrance vestibule. There are internal doors leading to the main vestibule to the Church and the hallway to the kitchen. There are about 12 large tables and plenty of chairs. Serving hatch from kitchen. The lounge is situated between the Main and Small Halls. It is approximately 3 x 6 metres and has its own toilet and washbasin. It is suitable for use as a small bedroom or quiet room. This small room, with a separate gas fire, has en-suite toilet and wash basin. This room may not always be available, or may have to be vacated for short periods for interviews, etc. The Church hosts a regular luncheon club. Because of this our kitchen meets current health and hygiene regulations. It has a catering standard double cooker, dishwasher, hot cupboard, urn, cutlery and crockery. The basement is not currently available for use. Directly opposite the Church is a convenience store.